The Teufelsberg. A ruinated history. For some of the readers, this historical site won’t be new. For the others, this place is a true discovery. For both of them I will provide new information about the oldest and newest developments around the Field Station Berlin, better known as the spy station Teufelsberg. The history of the historical site goes back to 28 November 1937, when Hitler laid the first stone for the Wehrtechnische Fakultät – a military school. Except for a contribution to Nazi Germany’s military force, the Wehrtechnische Fakultät was a part of the project to develop the Ost-West Achse – a planned axis from the city centre East (Alexanderplatz) – passing the Siegessäule which was relocated from the Königplatz (now: Platz der Republik) to its current destination (the Großer Stern) in 1938, the Technische Hochschule (now: Technische Universität), the Adolf Hitler-Platz (nowadays: Theodor-Heuss-Platz) till the city’s West, where the Olympic Stadium on the northside and the Hochschulstadt – the covering term for the militair complex where the Wehrtechnische Fakultät was part of – should came on the southside. The Wehrtechnische Fakultät should have taught the new military elite. Its architect was by Albert Speer, who designed the school as a castle – intentionally reminding of an hierarchical environment. The construction of the Wehrtechnische Fakultät was put on a hold because Karl Becker – the leader of the building development – committed suicide in April 1940. As well as the Ost-West Achse, the Hochschulstad was never finished before Nazi Germany was defeated. When the Wall was build in 1961, the American NSA (National Security Agency) reacted with the construction out of a 27 meter high search tower on the Teufelsberg. Now, the Western secret services weren’t dependent of the department Human Intelligence – but created a department Signal Intelligence. During the heats and the colds in the Cold War, the spy station at the Teufelsberg expanded further. The most visible are the sites three white domes, which are build betweeen 1969 and 1972. The highest dome is 69 meter. As spectacular as the view over the city, are the amplified echoes when you are standing in the middle of the dome. Not only the alllied secret services took advantage of Berlin’s highest summit – 115 meters above sea level, of which 80 meters are above the surrounding plain – but also the West Berlin local population seemed to experiment with the artificial mountain. Next to the military defended area, the Teufelsberg and its surrounding became a centre for wintersport. In 1955 was a ski-jump presented at the Teufelsberg westside, which expanded in 1962 with a grandstand for 5000 visitors. Also a luge run was developed – with a wooden bridge over the tracks – which is still there to visit. Also were 120 liters Teufelströpfchen wine made yearly on Teufelsberg’s southern side in the period 1970-1984. Many of the Teufelsberg 1500 employees fulfilled their military service, and braught by a buss to the gate. Although the secret service spies worked in nine hour shifts and without long breaks, they also enjoyed comfortable working conditions – especially after an expansion in 1984. From then on, the canteen was accompanied by a casino, a fitnesstudio and even a Biergarten. An infamous employee who had somewhat too much benefits from his working conditions was James W. Hall. Hall had an officer rank which was high enough not to be controlled. Between 1982 and 1985 he worked at the Teufelsberg and earned over $100,000 with supplying hundreds of documents to the KGB. Hall was arrested in 1988 – a year later, he was sentenced for 40 years of prison and a fine of $50,000. The Teufelsberg went through a dynamic period when the Cold War came to an end. Some constructions, such as the Jambalaya tower, were finished. The NSA left the Teufelsberg in August 1992 and the site became property of the Wilmersdorf city council – which sold it in 1996 to the investor Gruhl & Partner for 5 million Deutsche Mark. Two years later, Gruhl & Partner started to construct villa’s on the Teufelsberg. Apartments up to 5 million DM were sold and the constructions started. When the Wilmersdorf council changed from CDU to SPD in 2001, the plans for the developing of villa’s were frozen in 2002. From then on, the Teufelsberg was officially an environmental area where construction was not allowed. Years of abandonment and vandalism followed and the only days that the Teufelsberg served a commercial function were the days that photographers and film crews hired the site. In 2007, Gruhl & Partner nearly rented the mountain to the experimental film director David Lynch (Mulholland Drive, 2001). Lynch nearly signed a contract, till he realized that he and the supporting Maharishi Foundation wouldn’t be allowed to develop a ‘Peace University’ and to build a ‘Tower of German Invincibility’ – so Lynch refused. Gruhl & Partner found a solution and rents the place to tour guides. Since December 2011 onwards, Andreas Jüttemann organises Sunday’s tours at the Teufelsberg. In May 2012, BerlinSightOut signed a contract with Gruhl & Partner, renting the place for developing tours and art-spaces. Nowadays it seems like one can only enter the site for a €7 tour during the week, or another €15 tour (€8 for discounters such as students) in the weekend. Visiting the site on your own is not allowed, also after you’ve paid for the tour. Also, one has to underwrite a Haftnungsausschluß – making it for you impossible to sue BerlinSightOut or Gruhl & Partner in case you get injured. In my opinion, the coming of any organisation – such as BerlinSightOut – was necessary after the lack of control and the following vandalism. I can recommand the tour, since I was pleased by the information and tempo of the tour. Though, I am not sure if the tour had to take €7 – which is high for Berlin standards. I won’t be pleased if Gruhl & Partner makes a profit out of this entrance fee – since you never know if they will make the moutain a heaven for the elite as soon as they can. Furthermore, the signing of the Haftnungsausschluß seams reasonable at the first sight, but doesn’t stimulate the owners and renters to improve the safety. On the other hand, it is a relief to see this unique site not more destructed than the previous time and some of the graffiti changed from tags into a delight for the eye. The negative side is that the Teufelsberg is already discovered by families as well as it is cooperating with the Berlin Welcome Card. This entry was posted in Weekly updates and tagged Berlin, Espionage, History, Teufelsberg by Joep de Visser. Bookmark the permalink. Good article Joep. I enjoyed visiting Teufelsberg. After visiting you can also walk in a big park situated around. 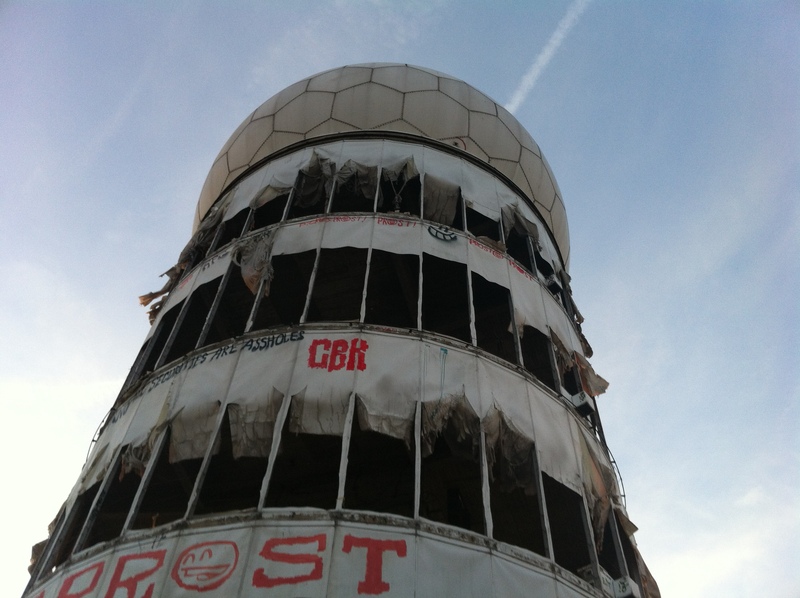 I am working on an architectural thesis about Teufelsberg and your blog is so useful ! Definitely want to know more about this place !